Opening up a tearoom was a dream and passion for sisters Andrea & Alexandra after visiting a tea room for the first time in 2009. We loved the ambience and décor as well as the scrumptious scones and cakes on offer and wanting to see more of what tearooms in the UK had to offer. 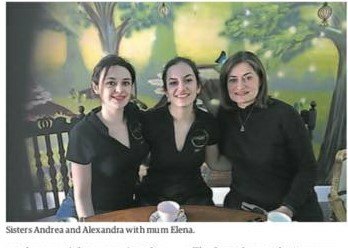 So, with the company of our mother Elena, we travelled the country to see what other tearooms offered and after having worked in catering for a few years and absolutely loving it, spoke about one day opening up our own. Andrea practised her cake skills, Alexandra learnt more about catering and management and Elena understood property and accounting like no one else. The best trio was formed and with each of our individual skills, we went on to research all about opening up a business, finances and speak to like minded people to gain an insight into running your own business. At the start of 2017, we knew we were ready to seriously look into this new venture and so started collecting vintage furniture, cups and saucers, researched some more (eating at tearooms of course which we absolutely loved) and looked for the perfect property and location. So many of the properties in Harpenden and St Albans were miniscule, without much room for seating let alone a kitchen. We wanted to stand firm with our dream of having home made food and cakes as opposed to the norm of buying products in. We wanted to feel proud of what we have made, using our own imagination and ensuring that all products are fresh. This dream became a reality when we found a Grade II listed building in Redbourn that we have today. After four months of hard work and with the amazing help of our father and his DIY skills as well as friends and family, we were able to transform a once empty, barren building into the vibrant tea room it is today. As of the 4th March 2018 when The Enchanted Tea Rooms proudly opened its front door to patiently waiting customers, we have been using fresh products to create our scrumptious breakfasts, light lunches, yummy Afternoon Teas and moreish cakes. We hope you have all enjoyed the journey so far and we look forward to another page of our book for the future.